It has been a while since I posted card projects so here are some new ones! - Cream card stock which was first 1) repeatedly distressed with Tim Holtz Distress Inks and sanding until I reached the desired effect. 2) stamped and embossed with a bird and nest image, then 3) colored with Spectrum Noir markers and Prismacolor pencils. The edges were inked once complete. A layering technique was used on the nest with a 2nd stamped, embossed and cutout nest image. - The label was created from a vellum quote which was a overlay for a larger label in the denim print paper. - A stamped and embossed cupcake image topped the card with a simple birthday sentiment underneath. - Card made from pink card stock. - Image colored with Distress Inks and Prismacolor pencils. - Button, rhinestone, floss and ribbon accents added..
- Overlay of print paper in a neutral cream and pink/red print. Corners rounded and then inked. Break out the Party Hats! It is Crayola's 110th Birthday! 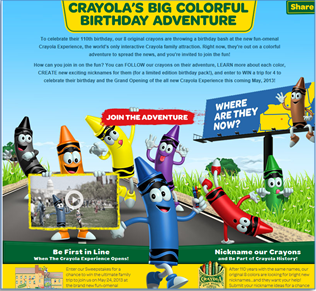 The 8 original colors are hosting a virtual birthday bash on the Crayola Facebook page and one lucky winner will win a trip to celebrate in person! Check on the new "fun-omenal" Crayola Experience, the world's only interactive Crayola family attraction. Visit the Crayola Facebook page and click “enter now” for your chance to be first in line when the Crayola Experience reopens. "The new Crayola Experience features four floors of new interactive exhibits and one-of-a-kind attractions that will bring the magic of color and your child’s creativity to life! The winner will be among the first to experience the fun, along with a three- night, all-expenses paid stay. It’s an experience your kids will never forget – and neither will you!" We had three rooms in our home that I consider unfinished - the front living room, the loft area and our sunroom. I finally decided to re-purpose the living room into a craft room and planned on doing so when I received a small inheritance that enabled me to step it up a notch. I keep saying that my craft room / art studio is finished but I always seem to find new things to change or add. My husband tolerates it but the girls and I LOVE this space. It is our refuge - a place to relax, create and be productive. I keep seeing other people share pictures of their craft spaces, so I will jump on the bandwagon and share what I have set up. This is where I store all of the ribbon and keep my recently finished pieces or work(s) in progress. * A board was painted in black (cork) and grey (trim).Once dry this was hung from the wall. * Long pieces of thick hemp twine were strung and secured on the bottom with a button or large knot to hold the spools in place. The spools were then simply threaded through the hemp and the top was closed with a slip knot - this then made it easy to hang from simple push pins. Finally glass jars were filled with loose ribbon and placed on top of the ribbon holder. On the left is a desk that I placed a hutch over. The hutch opens and has a corkboard on one side and a chalk board on the other. LOVE it! The drawers pull out - I keep embellishments and small items like brads, glitter, cricut cartridges, etc in the top two drawers. The large drawer at the bottom houses glue, glue sticks and glue guns, duct tape, finished cards and other larger objects. On the very bottom are three baskets to store yarn, knitting and crocheting items as well as the kids craft supplies. Here is a bookshelf for extra storage and the paper cubes. Since the bookshelf is getting full I have ordered one more stamp / punch holder for extra storage. I can then move some of the items around on the bookshelf. I also ordered a rolling cart which i will store the cutters and miscellaneous items such as reinkers and current projects. Here is the desk area. I sit on the left and the girls will sit on the right. So that is my space.... If you are thinking of creating a craft area go for it! You can always change up what you start with and as your space evolves, so can you.